The R.H.Carr was the ship that provided essential transport of people and goods to MacKenzie from Georgetown upon the Demerara River. In those days travel was only by river, no roads, consequently the R.H. Carr provided an essential link to the outside world and was a big part of everyone’s life. The leisurely eight hour journey seemed to hold a quiet romance with the R.H. Carr slipping through the virgin jungles close by on either side of the meandering Demerara River. There were the occasional scheduled stops, along with slow downs to allow vendors of local produce in small boats to come alongside and sell to the passengers of the R.H. Carr. The R.H. Carr was built in 1927 in Saltney, a small town in Wales on the river Dee just south of Liverpool in the UK. Under steam power she somehow made her way across the Atlantic ocean to British Guiana and was operated as a real live steamship before being converted to diesel in the 1950’s by the then owner Messrs. Sprostons Ltd. You just have to wonder why in 1927 would The R.H. Carr have been designed with a steam engine when the world had long since converted to diesel. My speculation would be, the availability of diesel fuel along the banks of the Demerara in 1927 could not compete with wood (The Walaba tree, also used to power the steam engines that provided electric power to Georgetown). You will also see references to the railway steam engines being used at that time in the Bauxite mines at Mackenzie. 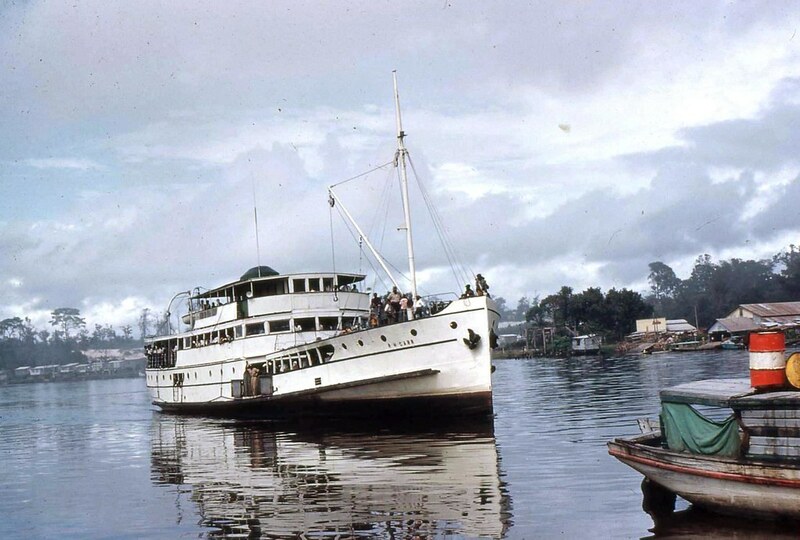 R.H. Carr, on the Demerara River, British Guiana circa 1960 (photo P Llyn-Jones). It looks to me that the photo was taken from MacKenzie with Wismar in the background. The completion of the Soesdyke-Linden Highway in 1968 connecting Georgetown to Mackenzie saw the removal of the R.H. Carr from the Demerara River service. At some point she was acquired by A. Mazaharally & Sons intending to put her to work in the Timber industry. She ended her days grounded at Skull Point. Or maybe not, checkout the two links near the end of this page. Featured Comments below: Have been used to update the text on this page. Evan Wong says…. The R. H. Carr was built as a steamship. When Sproston’s acquired her sometime in the early 1950’s, they overhauled her and put in a Blackstone diesel. Armorel Clinton says… My Grandfather was R.H. Carr. He was the Chairman of Messrs. Sprostons Ltd, Managing Director of the Demerara Bauxite Co and Vice President of the Northern Aluminum Company of Canada. Georgetown, and after his death, they returned to England. Roger Ally says… The R.H. Carr was purchased by A. Mazaharally & Sons, Ltd., a timber concern. The boat lies in ruins in the Mazaruni River at a place called Skull Point. Evan Wong says… Sproston’s and DEMBA both reported independently to Alcan in Montreal. Sproston’s was also the Catterpillar agent in BG, and DEMBA was the biggest user of Catterpillar equipment, so Alcan made the commissions on selling to itself. All the fishing trawlers used Catterpillar engines, so they had many other customers as well. John and Pauline Grimshaw from the UK have done a remarkable set of research and investigation into the birth and history of the R.H. Carr. Using Roger Ally’s comment (above) they somehow managed to confirm the ships last resting place and then with the assistance of A. Mazaharally & Sons they visited the wreck at Skull Point on Oct 21, 2009. That was a pretty simple sentence to write, but think about it. You’re going to venture into Deepest Guyana and trek over to Skull Point, well I suspect getting the logistics in place takes some doing. Try looking that address up on the internet. “Skull Point” is more than just an intriguing name. Yacoob Ally related to the Grimshaws that the name derives from the number of skulls that washed ashore there, in the dark days of the “Porkknocker’’. It is hard describe the exact location of Skull Point but John’s best guess is that it appears to be on the west bank of the Mazaruni River very near it’s confluence with the Cuyuni River. It is so close to the confluence that one might be tempted to say that it was on the Cuyuni River. Another description is to say that Skull Point is just upstream of the prison on the Mazaruni River. The video is in HD, so click the full screen button to view. Pauline has posted several photos of the R.H. Carr wreck on her flickr site, the photo below links to one of them, just click on it and browse to get the rest. John Grimshaw has done some internet sleuthing and sent in this link to a video showing the launch of the R.H. Carr in 1927 at Saltney, Cheshire, U.K. Video from British Pathe. Launching of the R.H. Carr (1927) at Saltney, Cheshire, U.K.
Not content with simply rummaging around in Guyana the Grimshaws then paid a visit to the place of her construction, Saltney, UK and followed the trail to the Flintshire Record Office where they received permission to post a collection of photos and newspaper clippings from the launching of the ship. Do not copy the following photo without the permission of the Flintshire Record Office. Launched on the Saturday 30th April 1927 the 308 ton RH Carr should have been in service the previous September but had, according to a contemporary report in the Cheshire Observer been delayed “owing to the disastrous strikes of last year, which completely held up British steel supplies and the vessel had to be built of all-British material” The strike referred to being The General Strike of 1926 which whilst only lasting from the 4th to the 11th May,(though the miners struggled on until November of that year) caused the delays in the supply of steel mentioned in the report. Originally laid down as the SS Potaro , the name was changed prior to its launch to SS RH Carr to commemorate Ralph Hamilton Carr, Chairman of Messrs. Sprostons Ltd, Managing Director of the Demerara Bauxite Co and Vice President of the Northern Aluminium Company of Canada who died in Georgetown in November 1926. The launching ceremony was performed by Mrs Esperson, wife of Mr. W.V. Esperson, Managing Director of the Northern Aluminium Company who acted in England at that time for Messrs. Sprostons Ltd of Georgetown. and this would suggest that it was Sprostons who ordered the vessel. All the directors of Crichton’s were present supported by a number of friends and a lunch followed the launching. In 1951 steam power was replaced by Blackstone 6EPV Oil Engines at Sproston’s Yard on the Demerara. Lloyds Registers showing when ownership changed. 1987 to 1988 Owners Government of the Republic of Guyana. This is the last year for which there is an entry in the Register. Here are a couple of other interesting internet links to articles about the R.H. Carr. There has been some interest in bringing the R.H. Carr back to the UK. Call for historic steam ship to be brought home from The Flinshire Standard Dec 24, 2009, includes reference to some of Pauline’s photos. John and Pauline Grimshaw have passed a recent document authored by Alan Barnes and published in the October issue of a vintage steam magazine called Old Glory. They have even managed to obtain permission from the author to circulate copies of the article. And so, I’ve pasted in below Alan Barnes’s article as three separate images. I too have fond memories of the vessel. What happened to her in the end? My lone trip on the RH CARR was in July /August 1967. The Linden highway was under construction and not yet opened. I remembered boarding at the wharf in Georgetown and my arrival at the docks at Mackenzie. At Mackenzie the boat will hoot its horn asking the launches and other small crafts to get out of the way. I remember seeing my big brother waving at me from a small crowded boat in the middle of the river as the RH CARR moored at Mackenzie. Fond memories. Restoration Please? I still don’t know where the R.H.Carr is today. But we have learned from my father that back in the DEMBA days, ALCAN via Sproston’s owned and operated the R.H.Carr. I remember when my mother, sister Virginia, and I joined my father in Mackenzie in 1957, the only practical river transport at the time was via the R.H. Carr. Due to the numerous stops made along the 65 mile trip up the river to Mackenzie from Georgetown to embark or disembark passengers, I remember distinctly my mother saying to me “the R.H. Carr has only two speeds, dead slow and stop!” It was a gruelling journey, especially for us young children, and I’m certain we drove our parents half crazy asking them “are we nearly there yet?” Later on, we relished at the thought of avoiding the R.H Carr for the comparative luxury of the Polaris, or the rare true luxury of the Dorabice! On a few occasions to head to G’town for quick shopping trips to Bookers and Fogarty’s, we jumped in a speedboat and raced happily by the R.H Carr as it trundled along. Cutting short the trip by hours, despite being blasted by the wind, was well worth it. And then eventually, along came Tom Wilson and his trusted DeHavilland Otter, and we were forever grateful! It seems a shame though that having been so much a central player in the Demerara River transport “scene” for so many years, that some entity in Guyana today can’t come together to preserve this old workhorse, rather than sending it back to the U.K.
Well, well, well it is truly amazing what one can find on the internet. What a fantastic site, so many evocative memories and so many names to recall – and I still haven’t looked at every photo or read every blog. So, Julian, if you are still watching this space, email me and I will send you an old b/w photo of us + your sister and Susan Roberts on the Dorabice as we wended our way back to school circa 1961. We lived on Arrowcane Crescent ie up the slope and around the bend from you. Didn’t your father have a marmajuke – phoenetically spelt! We lived in Mackenzie from 1954 to 1968; my father (Ken) worked at Demba and my mother (Barbara) taught kindergarten from approx 1960 to 1966. Having never responded to a blog before, I have no idea as to whether anyone else will pick this up. If you do, hello. And for those of us from the same era, we have some fantastic memories to share and a wonderful journey in front of us – so keep on posting and let’s get in touch. Does anyone remember James Adolphus Chapman who worked on the R H Carr prior to 1950? I am also called Winston Chapman and James Adolphus Chapman was my father. He died in 1948. We all lived in Georgetown – Dad, Mum, myself and 2 sisters. I think he was still Captain of the RH Carr when he died. We now all live in England and have done since the mid 1960’s. I am a Guyanese and I remember RH Carr, my dad worked with John Fernands Ltd, who operated a coal burning complex on the Demerara River (Horida). We always visit my dad on school vacation. Our travel day would start at around 7.30 am from Sprostons Warf in Georgetown on the RH Carr. We would travel all day on that great old ship until we reached our destination (Horida). Very fond memories about that great old ship. 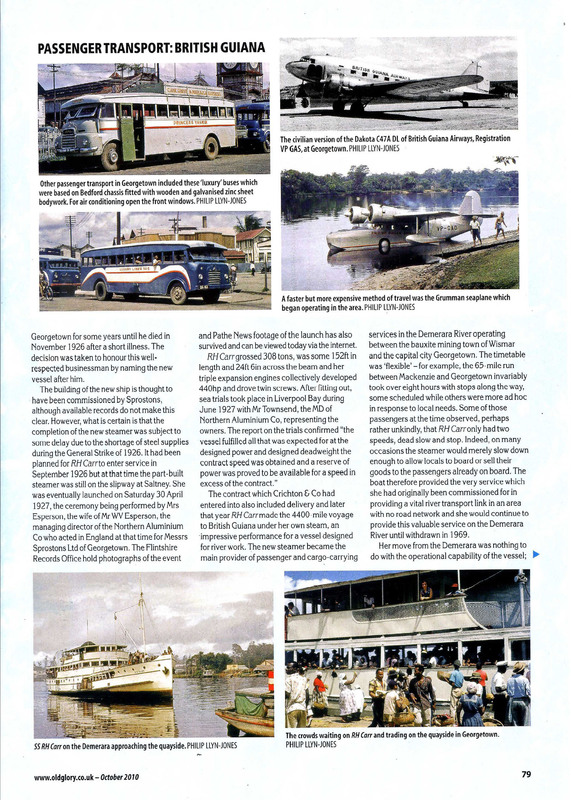 I do hope the Government of Guyana can preserve this old workhorse, rather than sending it back to the U.K. and could be used for river tourist cruises. The name is Sproston’s Wharf and was located at Lombard St and Broad Street in Georgetown, also The Horodia Coal and Timber Grant which was located on the Demerara River is now owned by Skip Roberts and it is a Cattle Ranch. I traveled up the Demerara on the R H Carr in late 1963 or early 1964 while stationed at Atkinson Field. Got to visit all parts of the ship. It had a large diesel engine; it was not a steam boat. The R. H. Carr was built as a steamship. When Sproston’s acquired her sometime in the early 1950’s, they overhauled her and put in a Blackstone diesel. Some information you have on the R.H. Carr is definitely erroneous. total Horse power of 500 h.p. vessel as 2nd.and Chief engineer in the fifties. R.H. Carr from Georgetown to Wismar/McKenzie as a Boson. His name was James Clarke. as my family and myself are looking to find out more info about him. I am a Guyanese living in St. Vincent and the Grenadines. I lived in Mackenzie for a number of years. I remember travelling of R.H. Carr many, many, times. It used to be fun travelling on it. As children we travelled on the R.H.Carr numerous times during the mid 50’s going to school in Georgetown or to visit the dentist for some gold fillings which I still in place to this day. I was at St. Gabriels Convent school so it must have been around 1958. While in ‘town’ we stayed at the Tower Hotel where Demba had a number of rooms reserved for staff and their families. I remember having Chicken in the basket or better known as Chicken in the rough(ruff). The purser of the R.H.Carr was Mr Rose during that period and his wife was a nurse at the hospital in Mackenzie.. I only knew her as ‘nursie’ as she was know to our family and perhaps to many others. The journey was slow but as small kids it was an adventure seeing all the numerous stops the boat made on it way to Georgetown. I remember mum buying fruit at the Atkinson stop and the money and fruit had to be thrown over the side of the boat. What year was RH Carr handed over to the government, does anyone know? BobW (John Grimshaw reports… Lloyds Registers showing when ownership changed. Hope this helps. The RH Carr was purchased by A. Mazaharally & Sons, Ltd., a timber concern. The ship lies in ruins in the Mazaruni River at a place called Skull Point. Yes good memories travelling down and up the demerara on the R.H.Carr. In retrospect it was indeed a tiring but fun journey travelling on the “Steamer”. Good to see that someone is using the name Markenburg. This was briefly the name of the area after the villages of Mackenzie, Wismar and Christianburg were amalgamated municipally into a town. A competion was run in the Guymine News (formerly Demba Digest) to name the new town. The name Markenburg won i.e. the residents named it that and the name was implemented. There was even a radio repair business downstairs at the corner of Arvida and Pine called Markenburg. Anyway political kissuppers in the Central government decided to override the decision and name the town after Linden Forbes Sampson Burnham, the President of the country. Even though I was a Burnham fan and Markenburg was a Burnham strong hold, I was and still am very angry that the choice of the local residents was thrown out. BobW (Gerry, On naming things after yourself. I prefer not to rename something, it destroys the historical record and dismisses the contribution made by the original namesake. If you want to make a name for yourself build something new, as in, make a contribution first. 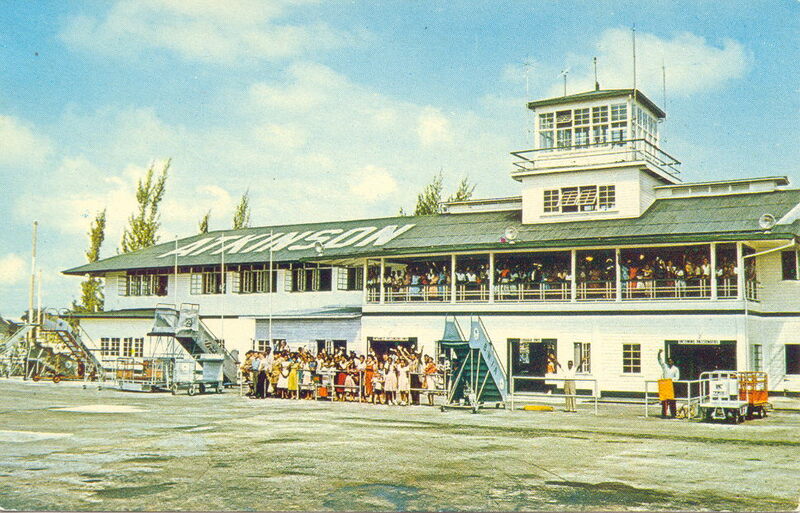 Case in point the Guyana airport, it was originally named Atkinson field after the guy in charge of it’s construction, probably paid for by the American’s as part of their war effort. This blog has been a very interesting discovery for me. When I was six, I lived in Mackenzie (1957) and I remember sitting up near the bow of the RH Carr on a trip to Georgetown, chewing sugar cane, watching the jungle as we passed very slowly by! My parents were Dave and Royce Forbes. My father was a doctor at the hospital and my mum the radiographer. Seems an age ago, so imagine my surprise to find info on the RH Carr as well! Thanks for the site – excellent! Hats off to all the “kids” who are keeping this history going. I admire those who go back. I can’t. I cannot bear to see all the skeletons. Fortunately we all have good memories, more or less … Thanks for keeping us up-to-date. It was a perfect place and because of it we are who we are today. After my career with Alcan came to an sudden end because of illness – in the 1990’s – I was given the opportunity by the company to get into early childhood education – very rewarding. Recently, I’ve been going over my journals with the plan to maybe one day when the spirit moves me to write my own story. Over the years, numerous books have been written by those who were born and grew up there, so it is that the place was indeed very special to lots of people. Certainly I am among those. I leave you with a phrase I came across recently. But before I sign off, Alex – I’m sorry that the photo you posted on your flikr site of the New Year’s dinner with all the writing on it was posted like that. The writing is mine and I had given Robert Castel a number of my old pictures which he posted to the web with my writing on them. I wish now that I had not written on them! Bob – I agree with you that original historical names should be preserved for the sake of continuity. Look what happens when bad politics take over! Such a shame. So much time and effort went into the business, not to mention funds, and to see what has become of it all is distressing to say the least. “Excellence is achieved only through consistency, innovation and teamwork” – an ad by a trust company published in The Economist in 1982. Take care. Did you have a sister called Helen and a brother Allen? Would love to get in touch with Helen. Funny I was up on the river by bartica a couple of times over the last years and saw the wreck no one knew anything about it when I asked. I think I went on it once? I personally enjoyed the fact that it took so long to travel to Georgetown on the Steamer. (With 4 of us children and my mother going to visit relatives in Georgetown, it wasn’t that often that we could get a place on the Grumman. Of course things changed once Demba acquired the Otter). We always took a picnic and I loved just watching the riverbank go slowly by and looking for activity and flowers in the jungle. At some points it was not very wide or is that just my memory playing me up. The Demerara River was so brown that with the creamy wake from the boat it always made me think of Coca Cola. We used to be on the top deck and enjoyed watching all the activity below. Of course as Nigel said staying at The Tower Hotel and having “chicken in the ruff” was always part of the treat. It is quite an interesting story of the R.H Carr.I truly hope that all will be done to restore her to her former glory. many Guyanese far and wide. What a great website! As a small boy I traveled on the R.H. Carr with my father, Pastor Arnold Kraner as he visited Seventh-Day Adventist churches up and down the rivers of old Guiana. For an 8 or 9 year old kid, the R.H. Carr was an escape into a world of excitement and romance. But the escape was never more pronounced than when, on one memorable trip, I drifted up to the bridge where a distinguished gentleman offered me an unidentified drink. Whiskey or rum, it matters not. I knew I had had a sip of that dangerous stuff I was always being warned about. When I told my Dad, as a good lad would, he laughed and said I’d be just fine. The banks of the muddy Demerara slipped by as I hazily pondered the exotic possibilities of worldliness. I grieve for the old boat. Thank you photographers and web masters for preserving her. I travelled on the RH CARR on a few occasions. It was sad to see what had become of this vessel. I only wish that it could have been preserved in a maritime museum. She deserved a better resting place. I could see her moored at a stelling in Georgetown being used as a restaurant if she couldn’t be anything else any longer. In Geneva, Switzerland, they used to do that; don’t know if they still do. The shipyard that built her must be disappointed too. She was so well-built and served us so well. I know we’re talking about an object here, but the memories; those memories! Found this site and looked at the movie of RH Carr as a wreck, on the movie we could se another wreck on the left of RH Carr. Do any know wich vessels more are situated on the same spot? Here is a link to a 1918 article, Glimpses of Guiana, that mentions Sprotons, and recommends that a ship would further travel needs in Guiana. I remember the RH Carr. As a boy in the 1950.s going from Georgetown to Mc Kenzie. When the tide was against you you would leave GT at 8am and arrive at 8PM. If you got a good tide you would arrive at 5 PM. I still remember the small boats that came out from my uncles( Brash Dias) plantation at Vryheid/Sand Hill with bananas, pineapples etc. Those were great times to be in Guyana. I think the boat was first named SS RH Carr because it was steam driven and after those diesels were installed it became MV RH Carr. It must have been fired with coal as it crossed the Atlantic to Br. Guiana. I recall the loading of sufficient Wallaba wood at Wismar, enough for one up and down voyage,,undoubtedly the firewood burning to produce steam, caused severe deforestation. No story of the SS or MV RH Carr can be complete without mention of Captain Benjie, he still lives in my memory, as I picture him, dressed immaculately in his white maritime uniform at the helm! We shall forever remember Captain Benjie, he must be furious in his grave to see what happened to his beloved ship. 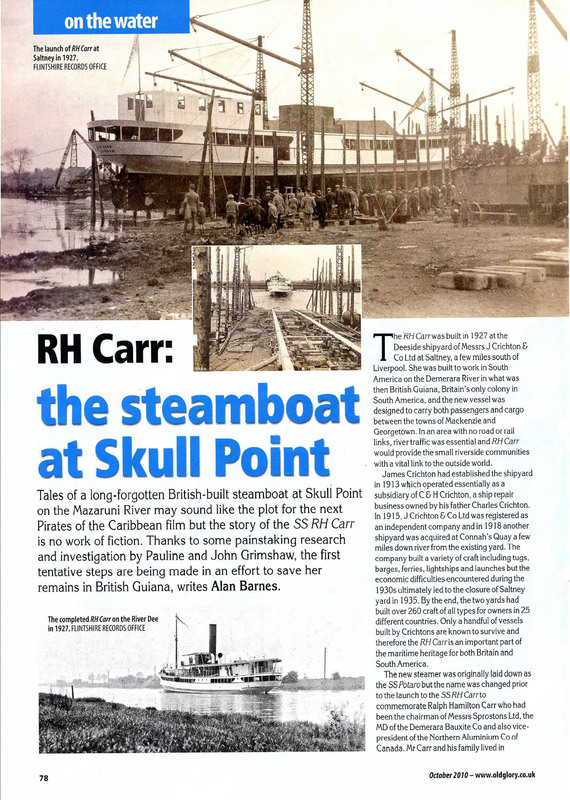 RH CARR and Skull Point .. I did a rough calculated guess and came up with information that Capt Benjie must have transported more than one million souls safely between Georgetown and Wismar, during the many years he was in charge of the RH Carr. There was however, that day when he rear-ended the vessel into the southern section of the Wismar stelling, and the incident immediately became the talk of the town for days on end, with the curious wanting to see and know how it happened. Rumors abounded about the reason for the accident and his subsequent suspension for three months for that singular unfortunate event.My own hindsight suspicion was that there was some misunderstanding and bad calculation among all parties concerned, and for unknown reasons.. For those who do not know, the mooring of the vessel is a skilled endeavor necessitating untold coordination among helm personnel, engine room crew, and dock hands. The helm personnel must also consider the tide and the fact that unlike a land vehicle, there are no brakes and in those days the communication between the captain and the engine room was restricted to a crude telephone instrument that marked and displayed the various options dictated by the Captain on the bridge, to the engine crew..
First the captain directs them to stop engines when the vessel arrives at a certain distance from the wharf; the vessel then drifts at a determined controllable rate with its momentum, combined with either the flow , or against the existing tide. Concurrently a crewman is located on the bow and his tool is a half inch manilla rope with a specific knotted ball at the end to add weight, This guide rope is attached to the 4 inches manilla looped-ended rope, which rope is wound on a steam driven winch (capstan,) located on the deck of the vessel. (smaller nylon ropes were unavilable in those days) The dock crew man must catch the thrown rope at the northern end of the dock and run to the mooring bollard located at the southern end of the dock, and place the then mechanical fed moooring rope on the bollard before the vessel reaches the corresponding parallel point. The winch ( capstan) is then activated to stop further displacement of the vessel. Finally other mooring lines, one at the stern, and another at mid ship called spring line, are then placed on their respective bollards.. The mooring is completed and passengers and cargo can be discharged;.Captain Benjie’s task is completed until the next ship’s activity. Transport trying to use this vessel as a ferry, still get nightmares. Clifford you are right, T&HD tried using RH CARR on the Berbice ferry after Government acquired the vessel, I think in the late 60’s, not sure but just before I joined the T&HD pilot service. The vessel gave those old T&HD Captains a hard time to handle, simply because the engines were direct drive ( no gear box ) which they were unaccustomed to. As a result the vessel ran in to the stellings quite a few times, even damaging the gantry at New Amaterdam stelling. The Marine Superintendent then sent me to Berbice to see what was the difficulty with handling this vessel. You see the compressors could only provide five starts after which they became empty and would take along time to build back up the air. So if the manoeuvre took more than five starts (which might very well be the case if the tide was slack)the captain was in serious trouble. So when I arrived at New Amsterdam I informed the Superintendent of Stellings that I would only be working the vessel when the tide is either flooding or ebbing, not at slack water, and certainly not with any schedule which he had set.. Naturally he wanted to know who was this young upstart who went into his kingdom telling him when and how the vessel will run, this was unheard of, but as we were cadets together you know me so you know the result. I worked the vessel without incident as master, trained my mate Joseph Henry (now deceased) who also handled the vessel quite professionally in my absence until it was probably sold to A Mazaharally & Sons. The other guys as mentioned by Mr Barrow were Vibert Swami, Cleo Da Silva, George Walks ( deceased) Maxie Cush. Not sure about Ronald France who was also a Sprostons pilot with George Walks. There was a Clarence London who was a schoolmate in Junior Form at Enterprise High School on Camp Street, next to London Cinema. Are you that person? Yes I am the individual. Cabbie Humphry was principal at the time took over from RBO Hart after we moved from Hadfield Street. You can cony tact me at :cnlondon8@racsa.co.cr. Or on Skype. HI Burnett – M name is Ayesha London. I was going through this newsletter and came across your conversation with my dad, Clarence London. Sadly, I must inform that my dad passed away unexpectantly on Nov 19 from appendicitis. He and my mom have been living in Costa Rica for the past 29 years. My mom, Cicely is still residing there. I can be reached at alondon37@yahoo.com. If my memory is correct, when Mr Benjie retired as Captain from the RH Carr sometime in the sixties,he was replaced by a man named Swami ( his first name I cannot recall), then it was George Walks, then Maxie Woods. I have no more recollection after that because I left the Country. RH Carr brings back a lot of memories. Does anyone know what happened to the steam vessel “Sproston Wood” built in 1881? My great grandfather was a pilot for Sprostons and was shown as being the captain of the Sproston Wood in 1889. His name was Edmund Stanley Haynes though he was always referred to as Captain Haynes. My mother,who was born in Georgetown in 1927, has memories of him when she was a very young child. I’ve no idea if Edmund captained any other steamers but my mother seems to think he used to come over to England to sail them back to BG?? Would this be correct and does anyone know how I may be able to find out more information? My mother was from Georgetown BG. Her name was Stella “Polly” Pollard. Her grandfather was Captain Haynes, Her mom, my grandmother was Amy Haynes or Mrs CH Pollard. My mother lost all her family photos in a fire before coming to the US. Does anyone know where I could find hotos of captain Haynes.. It’s hard trying to track down what’s left of my mother’s familyor any records of them. 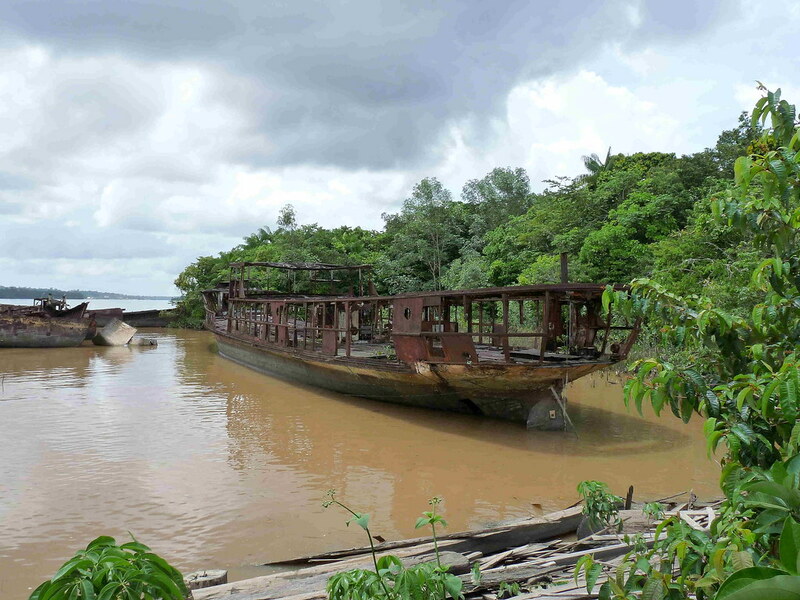 The nostalgic memories of this particular boat are remembered and bring a particular sad feeling to see the ruins. Most of upper Demerara residents used the R.H Carr for transportation. The exceptions were the many speed boats or launches. The speed boats took only one hour but did not complete the entire journey to port Georgetown and stopped at the Atkinson base where taxi or bus completed the trip. The R.H Carr took a relaxing 8 hours and held a special bond with all passengers. 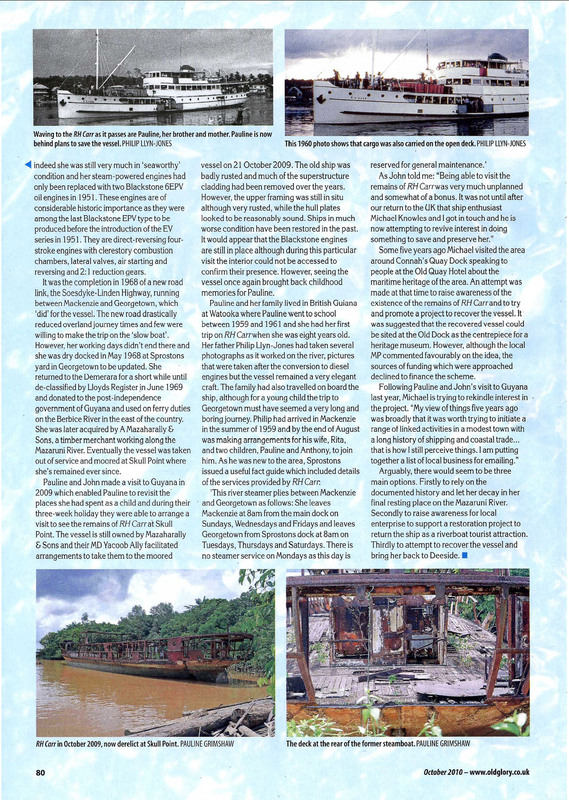 The slow journey through the meandering Demerara River was punctuated with frequent stops in the middle of the river as passengers got off or on into small boats. It was exciting to see the occasional cow transported. Cattle were pushed out into the river and had to complete the trip to pasture by swimming. For many it was their only contact with the riverain areas. The area of Linden is like an oasis surrounding by jungle. Most of the area’s new population who came from Guyana’s coastal communities and the many Caribbean Island had little knowledge of inland Guyana. This was a great opportunity and experience for all to see Guyana’s hinterlands. I still remember running down the steep steps of third class as a child to buy gynip or drinking a cold coca cola at D’Aguiar while watching the large propeller of the boat churning up the brown water of the river. We would wave as we passed the people on the shores or in boats on the river in a kind of farewell salute to a time of innocence. Very little information and relics remain of the early history of upper Demerara. This excellent poem was obtained from the book “Run Softly Demerara” by Zahra Freeth. This striking poem is on target and tells volumes of the area’s history. We have seen the historical periods of the Paterson Sawmill and the Wismar Rockstone Railway almost vanished from the record including the 8 sq.miles of plantation that Robert Frederick Allicock had owned in 1800. That area included the entire area from Arakwa creek to the north to “Three Friends” or Maria Elizabeth to the north Most families with recent connections to river areas are acutely aware of this trend. The relentless jungle takes over rapidly. The chapter of the steamer service in Demerara is almost lost in 2011. This poem was from 1960. History has since moved downriver and across the oceans of the world as so many migrate from the area. With the declining fortunes of Bauxite, this phenomenon also appears to be at work. This poem continues to very meaningful and echoes across the ages. Hello all. I was thrilled to find this blog. R.H. Carr almost caused my younger brother’s premature birth! I was ten and my sister eight in mid ’66. The trip was long and slow and the Blat! Blat! Blat! of the diesels was fatigueing to my mum. On arrival in McKenzie, we had to immediately catch the Grumman back to Georgetown. That’s another story as the thing was so loud inside, I ended up having to use the barf bag. We used to stay with the Chan’s in Watooka and that was special. I recall they would go to canada on holiday leaving the doors open, food in the fridge, lights burning. No fear of crime at all….until the highway opened. Then it was all downhill from there..Progress has its price. Now I see that two new boats are comming from China. Maybe a whole new generation of memories for those who will sail on them. God Speed. We lived right beside the Demerara river in one of about five or six company houses. There was a club house, too. My father was Emmanuel Davies and mum was Phyllis Davies. There was a man names Bob ‘Dot’ I think. Finding this page has given me a great insight in to rh cars history , reading some of these magical comments bring the boat back to life . Im sure this ship and many of these stories will play a part in a heratage centre being planed in connahs quay , a little way down the river from where the the RH Car was built , an organisation of local fishermen (connahs quay watermans association ) are planing a community use building with a link to the history of the local docks ,quays and shipbuilding which town was founded on . my grand father would walk me down the river when i was very young too see the bigger tides which on first of flood have a bore or large wave he would talk of the ships that were built here with pride and always wished for them to remain safe. Glad you enjoyed it as much as we did finding it again. If you want copies of any of the photographs we took let me know. The sight of the R, H Carr has brought back wonderful childhood memories. I used to be a young ‘scrawny’ kid who swam buck ‘naked’ in the Demerara River; luxuriating in the great swell of this boat as it passed by the river banks at Christianburg. I recall the many times I ignored the sage advice of my parents to stay out of the river especially when big boats such as the R.H Carr and and bauxite bearing ships were going by. Those days, as so many of you have stated were idlyic and are long gone but the memories have not faded . I am hopeful that someday enlightened guyanese of all stripes will make something of this beautiful land. I was 2nd mate on a 20,000 bulk carrier called Baron Dunmore in the late 60’s and early 70’s on charter to Alcan. We used to go up and down the Demerara loading bauxite/alumina in Mckenzie. We were the biggest ship to go up there along with a couple of our sister ships the Baron Belhaven and the Cape Race. We could only load about 8,000 tons because of the limiting depth of water. We used to load to about one foot more that the expected height of tide as it was assumed you could push about a foot of mud! Even then on the way down we had to anchor at Sandhills to await the next tide to get over a bar. All the locals used to come out in canoes to sell their fruit and drink etc. I still have several slides of these colourful activities. We would take the bauxite to Chaguramas in Trinidad and either dump it there to a stockpile or load a full cargo and take it to Port Alfred in Quebec. We also used to go to Surinam up passed Paramaribo to do the same thing. I recall the name of the river pilot was a Mr Jonas. Happy days, a long time ago now. Very interesting comments by Mr. Norman Clarke a former second mate aboard the MV Baron Dunmore which brings back lots of fond memories. However that vessel was not the “biggest ship” going up and down the Demerara River at that time. Before I go into the details however I must state that the 20.000 ton mentioned was the deadweight tonnage of the vessel (19,958 to be exact). The gross tonnage was 12,660 and the net tonnage only 6,914. In fact she was the smallest of the three sister ships that traded on that route at that time regularly. Her two sister ships as mentioned were Baron Belhaven deadweight tonnage 23,340, gross tonnage 14,885, net 8,802 and Cape Race gross and net tonnages were the same except the deadweight which was 23,310. As an aside the Baron Dunmore was 12 feet less in length than the other two, 530′. Vessels that were much larger than Baron Dunmore included the bulk handlers Bajka and her sister ships the Bama and Bakar to name a few, with gross tonnages of 18,051. Some of the vessels larger than those mentioned in Mr. Clarke’s very interesting article had deadweights in the middle and late 20,000’s and lengths of 575′ plus. It was a requirement for us as sea pilots attached to Transport & Harbours Department to record the gross tonnage of vessels piloted in order that pilotage fees could be levied. Vessels allowed to load one foot more than the depth of water at the Demerara bar in the ship’s channel had to first satisfy certain conditions: The horse power had to be at least 80% of the gross tonnage, they had to have a high intake for the cooling system from sea water, or they had to be able to use water from internal sources for at least one hour. Having served as a sea pilot during that time and piloted the vessels mentioned above and many others on several occasions in ballast and loaded conditions my contributions are factual. With regards to the river pilots who were attached to Sprostons Ltd. names that come to mind are Messrs. Jonas, Persaud, Mc Allister, Walks, France, Van Sertima, Crammer. The chief Pilot was Wilfred Beete. Sorry to hear about your father. Would he remember a Boson in guyana by the name of James Clarke. He was a short thin man with gold teeth. Any help is getting info on him would be appreciated as he is my grandfather and I am looking for info on him. Well, hello Chris Cook. My dad was Chris Cragie and he worked with your dad. I remember you when you were a baby! The last time I saw you was in London you were about three. I remember tour parents very well. Hello Chris. My father is Denis Hogarth who worked for your dad at Sprostons from 1959 to 1964/5 and knew the RH Carr well. We lived at Lamaha Street Georgetown and I believe in the summer of 1963 we met and used to swim in a tank in the car park! How is your father? Denis passed away in July 2010. Best wishes. Best regards to your Dad, I hope he recovers quickly and have many more years ahead of him. Many of us share fond memories of the R.H Carr, it seems with the development of the Road link between Georgetown and Mackenzie spelled the demise of both the R.H Carr and Guyana society. HI,the M.V.RH CARR was moored at the THD MAZARUNI DOCKYARD..in the late 1960’s .prior to being bought by AMazarally… I was there on weekends with myDAD on his weekend shift and tie hammock and fish in the Mazaruni river…. Dimitri many many thanks your reviving the past with nostalgia..
We have a picture of my mum you and me when I was about 2 or 3 in Barbados in the water at one of the beaches. That would have been late 50s. Did you go to boarding school in Barbados? Are you living in UK or Canada? It was nice seeing your post. How nice to hear from you. Yes I knew your dad well. He had a dog called Dina when I knew him in Guyana. I went to stay with him and his family for half term when I was a school in UK. Are you living in the UK now. We have a picture of you my mum and me in Barbados in the water when I was about 3, that would have been the late 1950s. people enjoy their life travelling to Mackenzie was a great adventure because the river was beautiful so was the R.H Carr it coincide. Nobody seems to comment on the general strike in B. Guiana around 1963 when a number of people were killed by a bomb placed on Thr R.H. Carr. The bodies were tied together and towed up to Mackenzie behind the Demba launch.Anybody remember this? Lovely country, lovely people – except for the politicians and their rabble followers! Does anyone have a photo of Edmund Stanley Haynes, known as “the Captain” who was the first captain of the Carr in the 1920’s?